A recent report on the November 2009 U.S. trade deficit found that rising oil imports widened our deficit, increasing the gap between our imports and exports. This is but one example that our economic recovery and long-term growth is inexorably linked to our reliance on foreign oil. The United States is spending approximately $1 billion a day overseas on oil instead of investing the funds at home, where our economy sorely needs it. Burning oil that exacerbates global warming also poses serious threats to our national security and the world’s security. For these reasons we need to kick the oil addiction by investing in clean-energy reform to reduce oil demand, while taking steps to curb global warming. 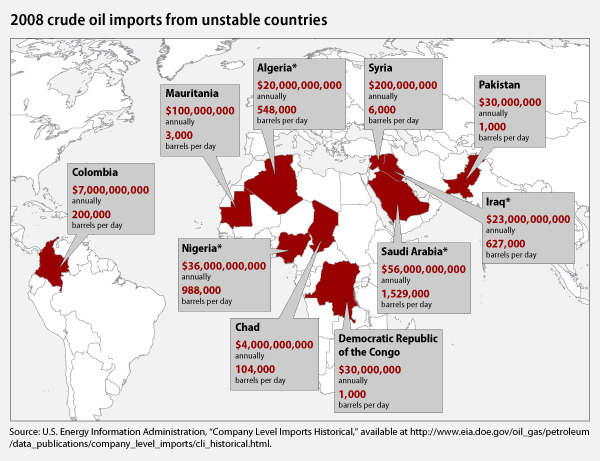 In 2008 the United States imported oil from 10 countries currently on the State Department’s Travel Warning List, which lists countries that have “long-term, protracted conditions that make a country dangerous or unstable.” These nations include Algeria, Chad, Colombia, the Democratic Republic of the Congo, Iraq, Mauritania, Nigeria, Pakistan, Saudi Arabia, and Syria. Our reliance on oil from these countries could have serious implications for our national security, economy, and environment. The United States imported 4 million barrels of oil a day—or 1.5 billion barrels total—from “dangerous or unstable” countries in 2008 at a cost of about $150 billion. This estimate excludes Venezuela, which is not on the State Department’s “dangerous or unstable” list but has maintained a distinctly anti-American foreign and energy policy. Venezuela is one of the top five oil exporters to the United States, and we imported 435 million barrels of oil from them in 2008. Further, the regimes and elites that economically benefit from rich energy resources rarely share oil revenues with their people, which worsens economic disparity in the countries and at times creates resource-driven tension and crises. The State Department cites oil-related violence in particular as a danger in Nigeria, where more than 54 national oil workers or businesspeople have been kidnapped at oil-related facilities and other infrastructure since January 2008. Attacks by insurgents on the U.S. military and civilians continue to be a danger in Iraq. Our oil dependence will also be increasingly harder and more dangerous to satisfy. In 2008 the United States consumed 23 percent of the world’s petroleum, 57 percent of which was imported. Yet the United States holds less than 2 percent of the world’s oil reserves. Roughly 40 percent of our imports came from Canada, Mexico, and Saudi Arabia, but we can’t continue relying on these allies. The majority of Canada’s oil lies in tar sands, a very dirty fuel, and Mexico’s main oil fields are projected dry up within a decade. Without reducing our dependence on oil we’ll be forced to increasingly look to more antagonistic and volatile countries that pose direct threats to our national security. Meanwhile, America’s voracious oil appetite continues to contribute to another growing national security concern: climate change. Burning oil is one of the largest sources of greenhouse gas emissions and therefore a major driver of climate change, which if left unchecked could have very serious security global implications. Burning oil imported from “dangerous or unstable” countries alone released 640.7 million metric tons of carbon dioxide into the atmosphere, which is the same as keeping more than 122.5 million passenger vehicles on the road. Recent studies found that the gravest consequences of climate change could threaten to destabilize governments, intensify terrorist actions, and displace hundreds of millions of people due to increasingly frequent and severe natural disasters, higher incidences of diseases such as malaria, rising sea levels, and food and water shortages. A 2007 analysis by the Center for American Progress concludes that the geopolitical implications of climate change could include wide-spanning social, political, and environmental consequences such as “destabilizing levels of internal migration” in developing countries and more immigration into the United States. The U.S. military will face increasing pressure to deal with these crises, which will further put our military at risk and require already strapped resources to be sent abroad. Global warming-induced natural disasters will create emergencies that demand military aid, such as Hurricane Katrina at home and the 2004 Indian Ocean tsunami abroad. The world’s poor will be put in the most risk, as richer countries are more able to adapt to climate change. Developed countries will be responsible for aid efforts as well as responding to crises from climate-induced mass migration. Military and intelligence experts alike recognize that global warming poses serious environmental, social, political, and military risks that we must address in the interest of our own defense. The Pentagon is including climate change as a security threat in its 2010 Quadrennial Defense Review, a congressionally mandated report that updates Pentagon priorities every four years. The State Department will also incorporate climate change as a national security threat in its Quadrennial Diplomacy and Development Review. And in September the CIA created the Center on Climate Change and National Security to provide guidance to policymakers surrounding the national security impact of global warming. The CNA Corporation’s Military Advisory Board determined in 2007 that “Climate change can act as a threat multiplier for instability in some of the most volatile regions of the world, and it presents significant national security challenges for the United States.” In an update of its 2007 report last year CNA found that climate change, energy dependence, and national security are interlinked challenges. Many major oil companies and their trade association, the American Petroleum Institute, are some of the most vocal opponents of increasing American energy independence and reducing global warming pollution. This is likely because they profit by buying oil from “dangerous or unstable” states. This includes importing oil from Syria, Saudi Arabia, Nigeria, Mauritania, Iraq, Congo, Colombia, Chad, and Algeria. In 2008 Chevron made a profit of $23.9 billion while nearly half of its imports—138 million barrels of oil—came from these countries. 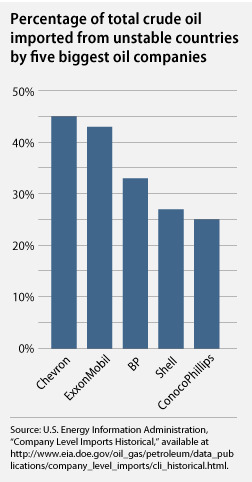 ExxonMobil made $45.2 billion while getting 43 percent of its oil—205.6 million barrels—from these countries. About one-third of BP’s imports—110.6 million barrels—were from these countries in 2008, when the company’s profits were $25.6 billion. 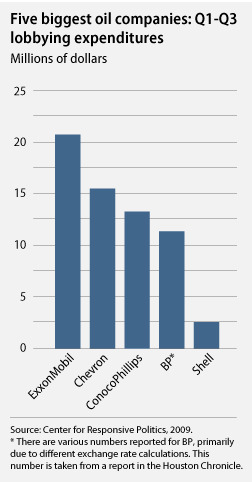 Approximately 25 percent of ConocoPhillips’ imports were from “dangerous or unstable” countries—116.7 million barrels—in 2008, contributing to its $52.7 billion profit. And Shell raked in $31.4 billion that year, also importing one-quarter of its oil—61.8 million barrels—from these countries. (Note: Shell includes Shell Chemical LP, Shell Chemical Yabucoa Inc, Shell US Trading Co, Shell Oil Co, and Shell Oil Co Deer Park). With that kind of money it’s no wonder Big Oil is doing everything in its power to maintain the status quo. The companies are spending record amounts on lobbying to stop clean-energy and climate legislation. The American Petroleum Institute spent $75.2 million for public relations and advertising in 2008, and in the third quarter of 2009 the oil and gas industry outspent all other sectors lobbying on climate change, with Exxon Mobil leading the pack spending $7.2 million. Oil companies are also the main source of funding for API’s front group, Energy Citizens, which makes false claims that climate change legislation will be a national energy tax and job killer. In reality, passing clean-energy and pollution reduction legislation will be affordable and even save consumers money while creating a net of 1.7 million jobs. The United States has an opportunity right now to reduce its dependence on foreign oil by adopting clean-energy and global warming pollution reduction policies that would spur economic recovery and long-term sustainable growth. With a struggling economy and record unemployment, we need that money invested here to enhance our economic competitiveness. Instead of sending money abroad for oil, investing in clean-energy technology innovation would boost growth and create jobs. Reducing oil imports through clean-energy reform would reduce money sent overseas for oil, keep more money at home for investments, and cut global warming pollution. A Center for American Progress analysis shows that the clean-energy provisions in the American Recovery and Reinvestment Act and ACES combined would generate approximately $150 billion per year in new clean-energy investments over the next decade. This government-induced spending will come primarily from the private sector, and the investments would create jobs and help reduce oil dependence. And by creating the conditions for a strong economic recovery, such as creating more finance for energy retrofits and energy-saving projects and establishing loans for manufacturing low-carbon products, we can give the United States the advantage in the clean-energy race. Investing in a clean-energy economy is the clear path toward re-establishing our economic stability and strengthening our national security. Rebecca Lefton is a Researcher for Progressive Media and Daniel J. Weiss is a Senior Fellow and Director Climate Strategy at the Center for American Progress. Special thanks to Winny Chen, Rudy deLeon, and Ken Gude.